From Guard Duty: I am thinking of copying and pasting GD’s whole article into a future post, since he is copying/pasting an older (and out of date) Trifkovic article. Shame and Blame in the Face of Christian Europe by Bishop Amfilohije. At a time when the Moslem horde was threatening to overrun all of Europe, this truly valiant leader, having been inspired by an angelic vision, sacrificed himself and his army at the fateful battle of Kosovo on June 15, 1389. Choosing the heavenly kingdom over the earthly one, he and his army went to victorious martyrdom. 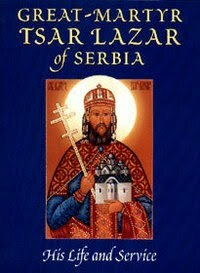 When receiving the Eucharist at the Divine Liturgy prior to battle, they all chanted in unison, “For the honorable Cross and golden freedom!”, followed by the famous words of St. Sava of Serbia, “Give up everything for Christ, but Christ for nothing!” As a result of the battle that Tsar Lazar waged on Kosovo Field, the Moslems never regained strength to take Western Europe. Thus, the Orthodox Kingdom of Serbia must always be acknowledged by Western Europe as that “sacrificial” kingdom which stood in the path of total Moslem captivity. “Between the two there was a morally necessary, legally and religiously obligatory state of war, until the final and inevitable triumph of Islam over unbelief. According to the law books, tis state of war could be interrupted, when expedient, by an armistice or truce of limited duration. It could not be terminated by a peace, but only by a final victory” (Bernard Lewis on the Ottoman Empire, quoted in Schindler, *Unholy Terror: Bosnia, Al-Qa’ida, and the Rise of Global Jihad,* pp. 20-21). Is Turkey trying to regain a leadership role? Given my leanings toward Byzantine and Serbian history, I don’t have much love for Turkey. Not to mention the ethnic cleansing of 1.5 million Armenian Christians in WWI. As most students of history know, Turkey tried to pursue a middle ground between secular liberalism and Islamic fundamentalism. The result wasn’t a golden mean but an uncomfortable combination of both–the worst of both worlds. It wanted the apparent benefits of modern liberalism: advanced societies, medical and technological breakthroughs, and a formiddable army. It also wanted the glory of the Ottoman days, something at odds with Imperial Liberalism. In any case, I suspect Turkey’s identity crisis is nearing an end. She sits upon the most important trade route in the world. Half a dozen of the world’s most important oil pipelines pass through her borders. She is a member of NATO, though I suspect that relationship will prove…interesting in the near future. Turkey is trying to fill a gap in the Islamic world. Per Huntingdon, Islam is the only civilization that doesn’t have a core state. Turkey wants this leadership role, but for the past 50 years it couldn’t achieve it. Muslims are usually divided with each other and in the absence of a common enemy (be it USA or Israel), there’s more infighting than at a Baptist deacons’ meeting. Fastfoward to the Israeli raids on Gaza flotilla. All Muslim and Arab countries are condemning, which isn’t saying much. Turkey and Syria are actually threatening war. I suspect that if Turkey can fight a reasonably successful war against Israel, even if only bringing it to a standstill, she can begin to reclaim her glory days. Unfortunately for Turkey, without American military support, her army isn’t that formiddable. Koran and Kalashkinov: Al-Qa’ida and D.C.
Dr Ayman al-Zawahiri, at one time al-Qa’ida’s number two man, maintains there is a direct connection. Courtesy to the Director of National Intelligence for making this speech available in English. As for the battles that are going on in the far-flung regions of the Islamic world, such as Chechnya, Afghanistan, Kashmir, and Bosnia, they are just the groundwork and the vanguard for the major battles which have begun in the heart of the Islamic world. We ask God that He send down his victory upon us that he promised to his faithful worshipers. Q. Do you regret having supported the Islamic fundamentalism, giving arms and advice to future terrorists? B. What matters more to world history, the Taliban or the collapse of the Soviet Empire? Some stirred up Moslems or the liberation of Central Europe and the end of the Cold War? Q. “Some stirred up Moslems? But isn’t Islamic fundamentalism a world menace today? B. Nonsense! There is no global Islam. Sword of the Prophet, p. 210. (One wonders if Brzezinski is saying that as an agent of the Regime and giving us disinformation, or if he is just plain stupid. Both scenarios are equally likely). Brzezinski is wrong on claiming that he brought about the demise of the Soviet Empire via Afghanistan. As Trifkovic elsewhere shows, the USSR was a husk long before one Russian soldier set foot in Afghanistan. The Soviet-Afghan war was expensive and drained morale, but it hardly destroyed the USSR. The West–our friend Brzezinski again–had established the American Center for Peace in Chechnya. That sounds nice but Chechnyan terrorists were some of the most brutal in the world. Why is the West supporting them? ACPC will say that they are supporting Chechnyan nationalism against Russian imperialism and not militant Islam. That’s only a half truth. There is a Chechnyan nationalism, to be sure, but Chechnya was once ruled by the Koran and according to Koranic law once a nation becomes dar al-Islam it can never go back to dar al-Harb. On May 24, 1999, Alla Geifman, a Russian Jewish girl of 12, was kidnapped by Chechnyan militants. Demanding ransom from her parents, they began to cut off her fingers. They filmed the whole ordeal and sent the film to her parents. She was eventually freed (Russian special forces would free close to 1,000 Christian and Jewish people kidnapped by the Muslims). But when she was released the U.S. rejected her visa application to get medical advice (the U.S. government later “reconsidered” her request after international outrage; Trifkovic, Defeating Jihad, 224). So…when Western officials aided Muslim Bosniaks they were working (whether ignorantly or openly) with al-Qua’ida networks? Next question: Given that America is opposed to al-Qa’ida and have been at war with said group for the better part of a decade, why was it wrong for Serb militants to break the siege of Srebenica and execute the 28th Bosnian Muslim Infantry, most of whom had al-Qa’ida ties, but it isn’t wrong when the US Army, fighting al-Qua’ida, turns Fallujah into a hole in the ground? One could supposedly answer, “Well, we didn’t know that the Muslims would suddenly take out their rage against the US.” I don’t really believe it. Middle Eastern jihadists have long preached jihad against the Great Satan. By placing them in Bosnia, arming them quite sufficiently, and giving them advanced terror networks in the 1990s, how could one avoid the conclusion that they would try to harm America? What’s the point of all of this? Do not ever let neo-conservatives (or the occasional hawkish neo-liberal–Lierberman, Clinton, and Biden) tell you that America is proudly against Muslim terrorists. That is simply not true. America is only against Muslim terrorists when Muslims threaten Israel. Otherwise, they give Muslims their full support (Pakistan is a trickier question, though I believe they are using Pakistan to attack Iran, which Israel perceives to be a threat. Interestingly, Israel funds an occasional Muslim terror cell in Central Asia; cf. Azerbaijan). The coming Iranian war has me thinking on who are the true dangers. It’s a question that doesn’t have an immediate “easy answer.” Three of the most important cultural/political/historical books I’ve read are Spenser’s The Politically Incorrect Guide to Islam, Trifkovic’s, The Sword of the Prophet, and Defeating Jihad. And of course, one must always mention how the US government imported thousands of Muhajaddin from Iran and Afghanistan (including associates of bin Laden) into Serbia for the purpose of killing Christians. Knowing all that, people immediately jump to the conclusion that all Muslims are bad and destroying “muslimdom.” To make the argument stronger, the Quran teaches that believers must bring Dar al-Islam to the Dar al-Harb. The Muslims who flew the planes into the towers were not extremists by Islamic standards: they were simply doing what they’ve always done, except now facilitated by technology and money. That being said, going and fighting many different wars against Islamic countries (usually and only for the sake Israel) is not actually helping weaken Islam. I won’t go into the arguments for “blowback” at the moment. But there is another factor: there are numerous Christians in the Middle East who suffer more under Israel than they do under Muslim regimes (Syria is 35% Greek Orthodox and according to some estimates Israel is 20% Christian). In fact, the second strongest political party in Syria, the Syrian Social Nationalist Party, was started by a Christian! Of course, believers are being persecuted in Muslim countries. That’s not for debate. But that’s not universally the case at the moment. I say all of that to clarify the idea that not all Muslim countries in the Middle East are necessarily bad for Christians. Accordingly, fighting Muslim countries is not necessarily good. I found the following at Foreign Policy’s website (I’m actually linking to Voice of Reason because I think the article is archived and inaccessible at FP). One might add that Iran hasn’t invaded anyone since the Islamic revolution, although it has supported a number of terrorist organizations and engaged in various forms of covert action. The United States has also backed terrorist groups and conducted covert ops during this same period, and attacked a number of other countries, including Panama, Grenada, Serbia, Sudan, Somalia, Iraq (twice), and Afghanistan. By any objective measure, therefore, Iran isn’t even on the same page with the United States in terms of latent power, deployed capabilities, or the willingness to use them. Indeed, Iran is significantly weaker than Israel, which has roughly the same total of regular plus reserve military personnel and vastly superior training. Israel also has more numerous and modern armored and air capabilities and a sizable nuclear weapons stockpile of its own. Iran has no powerful allies, scant power-projection capability, and little ideological appeal. Despite what some alarmists think, Iran is not the reincarnation of Nazi Germany and not about to unleash some new Holocaust against anyone. The more one thinks about it, the odder our obsession with Iran appears. It’s a pretty unlovable regime, to be sure, but given Iran’s actual capabilities, why do U.S. leaders devote so much time and effort trying to corral support for more economic sanctions (which aren’t going to work) or devising strategies to “contain” an Iran that shows no sign of being able to expand in any meaningful way? Even the danger that a future Iranian bomb might set off some sort of regional arms race seems exaggerated, according to an unpublished dissertation by Philipp Bleek of Georgetown University. Bleek’s thesis examines the history of nuclear acquisition since 1945 and finds little evidence for so-called “reactive proliferation.” If he’s right, it suggests that Iran’s neighbors might not follow suit even if Iran did “go nuclear” at some point in the future). Obviously, simple bean counts like the one presented above do not tell you everything about the two countries, or the political challenges that Iran might pose to its neighbors. Iran has engaged in a number of actions that are cause for concern (such as its support for Hezbollah in Lebanon), and it has some capacity to influence events in Iraq and Afghanistan. Moreover, as we have learned in both of these countries, objectively weaker adversaries can still mount serious counterinsurgency operations against a foreign occupier. And if attacked, Iran does have various retaliatory options that we would find unpleasant, such as attacking shipping in the Persian Gulf. So Iran’s present weakness does not imply that the United States can go ahead and bomb it with impunity. What it does mean is that we ought to keep this relatively minor “threat” in perspective, and not allow the usual threat-inflators to stampede us into another unnecessary war. My impression is that Admiral Mullen and SecDef Gates understand this. I hope I’m right. But I’m still puzzled as to why the Obama administration hasn’t tried the one strategy that might actually get somewhere: take the threat of force off the table, tell Tehran that we are willing to talk seriously about the issues that bother them (as well as the items that bother us), and try to cut a deal whereby Iran ratifies and implements the NPT Additional Protocol and is then permitted to enrich uranium for legitimate purposes (but not to weapons-grade levels). It might not work, of course, but neither will our present course of action or the “last resort” that Mullen referred to last weekend. Commentators speculate that by the year 2050 Europe will be largely Muslim. This is seen in Europe’s declining birth rate over against hordes of Middle Eastern immigrants and their high birth rates. Part of this failure is Europe’s vote of “no-confidence” in itself Many like to call the West a “post-Christian society.” In many ways, though, I think it is post-nihilist society. And, so it’s argued, Europe will continue to die off while Muslims come in. It only works under the assumption that things in 2050 will be identical to the way they are in 2010. But what many conservatives forget is that “things can happen” in a short period of time. In the years between 1918 and 1945 (fewer than 30 years) Europe undid 16 centuries of its heritage. Just because things are bad (or good) today doesn’t mean it will always be that way. Following above, the reasons why Europe is plagued with immigrants is partly due to its post-colonial heritage (a great evil, I admit). Another part is the humanist mentality of its leaders. The leaders of Europe (and America) honestly believed that all cultures are equal and even though Muslims believe things like Surah 9:5, if we show them the glories of liberal democracy, we can turn all of the jihadists into new Perez Hiltons. “Let’s respect the poor Mussies’ religion. All religions–except ancient Christianity–equal.” Will they keep saying that as Muslims carry out honor killings and begin executing homosexuals? And a few European countries are waking up. While little will probably come out of the Swiss minaret ban, it does show that sections of Europe are waking up. War in Iran: if the West/Israel carries out a potentially-nuclear war with Iran, whatever else may come of it, it will definitely change Euro-Muslims relations. Recognizing the Armenian genocide: As more countries begin to recognize the genocide the Turks carried out on Armenian Christians in the 1910s, relations with Turkey will sour. Turkey might decide that Europhilic politics isn’t worth it and go elsewhere. They might decide to force small confrontations in Kurdish Iraq or they could block shipping/troop transport in central Asia. The case of Serbia and Kosovo: Don’t really know what will happen here. The Regime (Brussels/London/DC) utterly controls the Serb government. It was NATO’s first example of “nation-building.” However, on the other hand, even liberals in Europe–while they may hate the Serbs–they are beginning to hate the Muslim Kosovars even more. Likewise, Putin’s Russia is not the same country as Yeltsin’s. Russia has played its diplomacy card with great skill. Russia and Serbia are showing the world that Kosovo is not a functional state. When the Kosovars ethnically cleanse the last few Serbs–the people who keep the hospitals and such running–the state will become a complete narco-gangster state. The only reason it will function is due to drug and prostitution money, along with donations by high-ranked Republicans in the United States. And Europe knows it. NATO is bogged down in Afghanistan. If the Serbs wanted to retake Kosovo, they probably could with Russian help. Russian special forces could air drop into Serbia. While they would need to fly over Romania and Hungary, the Russians might not ask for permission either. And Romania wouldn’t want to force a confrontation with Moscow, either. Following Samuel Huntingdon’s thesis (cf Clash of Civilizations), states are leaving the “liberal democracy” behind and are moving more towards community and tradition. When George Soros and the CIA staged “color revolutions” across the former Soviet Bloc in the 1990s, many thought that liberal demcracy would finally triumph. Those revolutions are eventually over. Saakashivili has failed in Georgia. The Orange Revolution is dead in Ukraine. Birth rates can change. As Sublime Oblivion has demonstrated, Russia’s birthrate has gone up–and it went up in during some of the worst economic crisises. Eurabia is a serious threat. I don’t make light of it. But it can be stopped. And it can be stopped rather easily. Islam isn’t that intellectually powerful. It’s a cultural parasite. After the 1500s Europe demonstrate that it can easily defeat Islam on the intellectual and military levels. And that’s no different today. The real bad is not Islam, but the neo-lib/neo-con politicians in power. Europe enacted a counter-1600 year change in the space of 28 years. It’s quite possible to revert the slide. Is 1204 a Paradigm Year for the West? While I defend the idea of the Crusades as a necessary and just response to the Muslim enslaving of 2/3 of the Christian world, I don’t defend every aspect of the Crusades. Of course, I refer to the 4th Crusade in 1204 Anno Domine where Western knights raped the city and turned Hagia Sophia into a brothel. Why do many Catholics and Protestants have an irrational fear and hatred of the East? (yes, I realize that bad things have been done on both sides to both sides; I am speaking of something deeper). If Islamic terrorism truly is a threat to world peace (it is, but drop the “terrorism” from the label and it will be more accurate), why do Western governments fund terror cells from Chechnya to Bosnia with the sole purpose of destabilizing traditionally Orthodox countries? Why is NATO so intent on encircling and weakening Russia when Russia has shown itself the only country to adequately deal with Muslim terror? Prof Srdja Trifkovic labeled the West as “theological revolutionaries” (referring to the insertion of the Filioque into the Creed). Perhaps this is apt. Revolutionaries are not necessarily interested in forming and maintaining long-term traditional and religious communities. Which means, I think, that the West is not acting inconsistently in sowing the seeds of its own destruction.